Training Camp Question #7: Who Will Be The Starting QB? This seems like a loaded question. It’s meant to reflect who will win the job in training camp, and start the opener against the Ravens on September 9. But isn’t the real question….How long before Josh Allen Starts? Before I get into trying to answer that question, let’s go back to the camp competition and try to answer the first question. 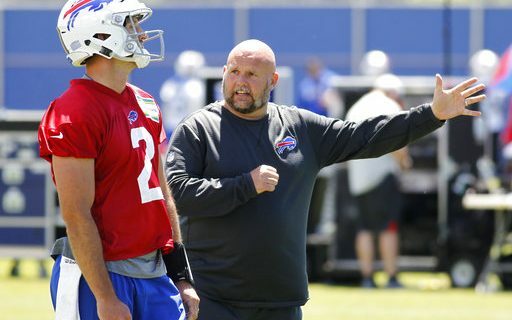 Based on what we saw during offseason workouts, OTA and minicamps, the QB ranking was Nathan Peterman & A.J. McCarron sharing #1 snaps, with Allen at #3. That is expected to continue for the beginning of camp. I can’t believe that arrangement will last more than a week or so. At some point, one of the three QB’s has to emerge as the leader. That player will get the chance to start the first preseason game against Carolina on August 9. If neither of them does enough to move ahead, then it’s probably Peterman’s start only based on more experience with the Bills. That’s the concern. If neither Peterman or McCarron, both with limited starting experience, grab a hold of the job then it opens the door for Allen. Grabbing the job means being accurate, grasping the offense, making adjustments and generating points. Because neither of them have done that enough in their career, we’re all asking to see what we haven’t seen before. When you have a highly drafted rookie who we also haven’t seen, that’s asking a lot of Nathan and A.J. Figuring out who is winning the competition will also be difficult. All eyes will be on Allen. That means every nice, deep pass will be cheered and shown on the TV highlights. There won’t be as much excitement when Peterman reads a blitz and dumps down to the tight end. He has the advantage of being the longest-tenured Bills QB. Yes, it’s a new offensive system so all three are starting from the same place in learning that. But Sean McDermott has already shown faith in Peterman. Too much for some people’s liking. He’s familiar with the offensive personnel. So I believe he has a bit of an edge. Peterman is smart, makes quick decisions and has the fortitude needed for a starting QB. Just bouncing back from the Chargers nightmare proves that to me. But he’s limited in arm strength, and enough NFL teams has doubts to make him last until the 5th round. To me, that screams backup material. Can he start? Sure. But my belief that if he starts, you’ll always be looking for someone better to replace him. He’ll need to show complete control of the offense in camp. He’ll need to be really accurate. He’ll need to recognize blitzes and coverages and make the right plays. He’s started an NFL playoff game that his team should have won. He’s won two national championships. He’s learned the NFL game for four years. These are all the positives that McCarron brings to the competition. The Bills made the effort to sign him in free agency, although I’m not sure he was their first choice. Those factors should be enough to give him the edge. I’m a little concerned McCarron didn’t come in and take the job, and move ahead of Peterman right away. I won’t hold that against him, but he needs to start showing all those positives right away. If not, and he can’t beat out a rookie or 2nd year player, then why keep him around? The experience is nice, but that only gets you to the first third down you need to convert. McCarron should win this job. That’s why he was signed, this is the chance he’s been waiting for. He’ll need to show all of those traits, plus a command of the offense to move him ahead of Peterman and allow him to hold off Allen. If not, I think he’s gone. I keep wondering if Allen won’t win the starting job, but he’ll get it because Peterman and McCarron lose the job. This will create a problem for the Bills. If they want Allen to sit and watch and wait, what happens if he is the best QB in camp? GM Brandon Beane has hinted at this. I believe he said that because he knows how limited the other guys are, and how talented Allen is and how good he’ll be. He was drafted 7th overall for a reason. He has everything the NFL knows you need to win. So we know he’s going to be the starter, but when is that? That decision will be made by either Peterman or McCarron, and their ability to keep Allen on the bench. Even if Allen doesn’t really get a chance to win the job because of principle, and a desire for him to watch and learn, it will depend on the other guys ability to win and silence the screaming for the kid. Don’t be mesmerized by all the frozen ropes Allen throws at camp. Pay more attention to his ability to be accurate, give receivers a chance to run after the catch and recognition of defenses. If he does all of that well in camp, then the other guys won’t matter. As we sit here now, I’ll say it’s going to be Nathan Peterman. For the reasons I stated above, I think he’ll do just enough to win the job. For a while. He is not the long-term answer. He’ll just be a holder of the spot until Allen is ready. As for Allen, his status as starter will be determined by how Peterman does with the job. If he wins, or the Bills remain .500, he’ll keep the spot. If they start 1-4, which is possible, then why waste time? Get Allen in there. So you might want to get some tickets for the home game against Tennessee on October 7. #5: Is Tremaine Edmunds Ready to Lead the Defense? #6: Will Turnovers Remain A Positive?